I guess I’ve been on a chickpea kick lately. Last week I shared cookie dough dip made with chickpeas, and now I’m feeding you gluten free brownies made with chickpeas. Yep, flourless brownies made from chickpeas. I can’t help it that I want you to be healthy and still indulge. It is extremely thoughtful of me, don’t you think? These vegan and gluten-free brownies are also refined-sugar free and extremely easy to make. All you need is a food processor, an 8×8″ pan and an oven. And, of course, all the ingredients. The ingredients in these chickpea brownies are (obviously) chickpeas, seed or nut butter, pure maple syrup, vanilla, cocoa powder, baking soda, baking powder, sea salt and dark chocolate. The video below will show you just how quick and easy these brownies are to make. You just throw all the ingredients, except the dark chocolate chocolate, in a food processor and let it go. Stir in the chocolate chips, spread the batter in a pan and bake it. The brownies bake at 375F for 22-26 minutes and are done when a toothpick inserted in the center comes out with just a few crumbs attached. The brownies need to be cooled completely before cutting. If you just can’t wait and decide to dig in, they’ll still taste delicious, but they will be pretty crumbly. Once they are cooled completely they will hold their shape and be much easier to eat. I know it’s hard to wait, and I don’t blame you if you dig in early, but now I can say at least that I’ve warned you. What do Chickpea Brownies Taste Like? 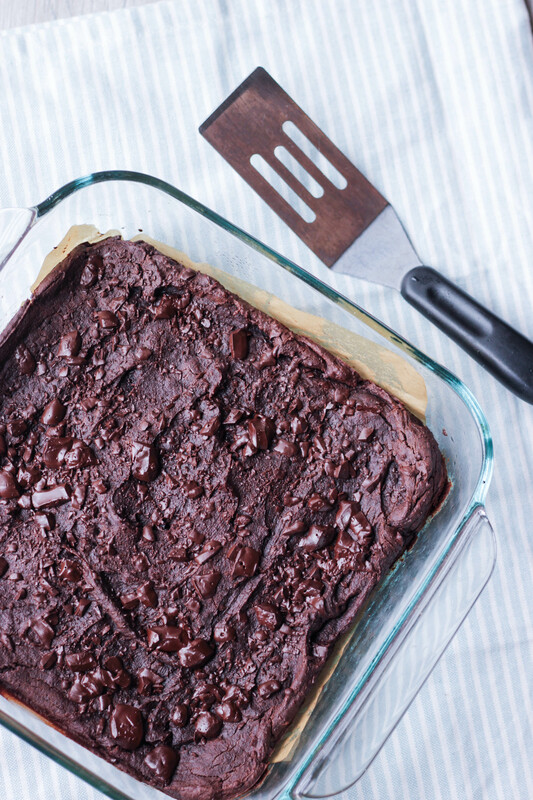 So, do chickpea brownies tastes like…beans?!? Nope. Not at all. Chickpeas are a fairly neutral flavored bean and once combined with all the other ingredients there isn’t a hint of bean anywhere. These brownies are dense and fudgy, with the perfect amount of sweetness from the maple syrup and dark chocolate. I was a little concerned the first time I made these that my daughters would immediately call my bluff, throw the brownies in the garbage and start a mutiny. But, they didn’t. They asked for more. Win. If you make these brownies please leave me a rating and review in the comments below. I would love to know what you think of them! These flourless brownies are made from chickpeas and are vegan, gluten-free and refined-sugar free. Serve this healthy dessert every night of the week and feel good about it! Preheat the oven to 375F. Spray an 8X8" baking pan with cooking spray and line with parchment paper. Set aside. In the bowl of a food processor, add all ingredients except for the chocolate. Process for 3-5 minutes, scraping the sides of the bowl down once or twice, until the batter is very smooth. Set aside 2 tablespoons of the chocolate. Stir the remaining chocolate into the brownie batter. Scrape the brownie batter into the prepared baking pan and use a spatula to smooth the top into an even layer. Sprinkle the reserved chocolate on top. Bake for 22-26 minutes or until a toothpick inserted into the middle comes out with just a few crumbs attached. Allow to cool to room temperature before cutting. Enjoy! If you liked this recipe, you may also like these healthy dessert recipes Chocolate Chip Cookie Dough Dip and Maple Pecan Roasted Pears.